It's really more fun investing in the Philippines. Just yesterday, the PSEi set a new record, our 26th record high for year 2013 and the 2nd highest record after we received the first ever investment grade debt rating from global credit rating firm Fitch. 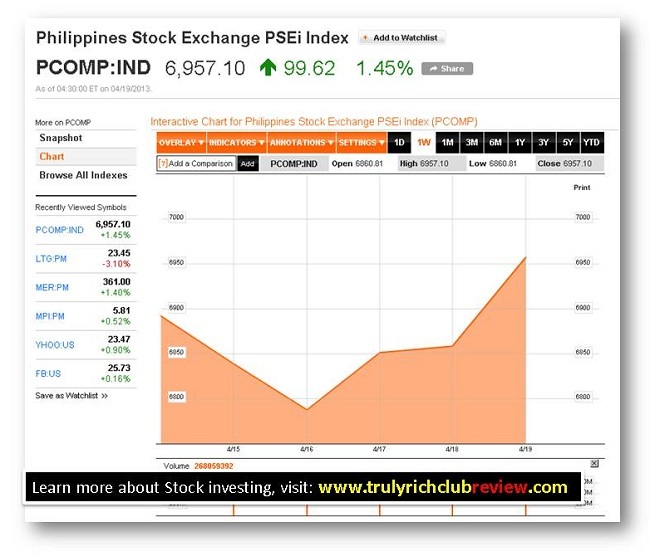 The Philippine Stock Exchange index rallied by 1.45 percent or 99.62 points to close at its best finish of 6,957.10. Congrats Pinoy and Happy investing! 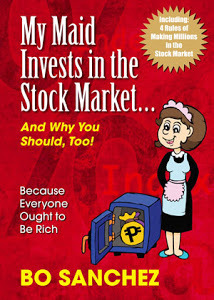 Still wondering how to invest in the Philippine stock market? You should learn more and do it the right way. Try Bo Sanchez' Truly Rich Club. The local stock index surged to a new record high Friday as investors bought local equities in anticipation of strong first-quarter corporate results and an investment-grade rating from a second global credit-watcher. The main-share Philippine Stock Exchange index rallied by 1.45 percent or 99.62 points to close at its best finish of 6,957.10, likewise a record intra-day peak. 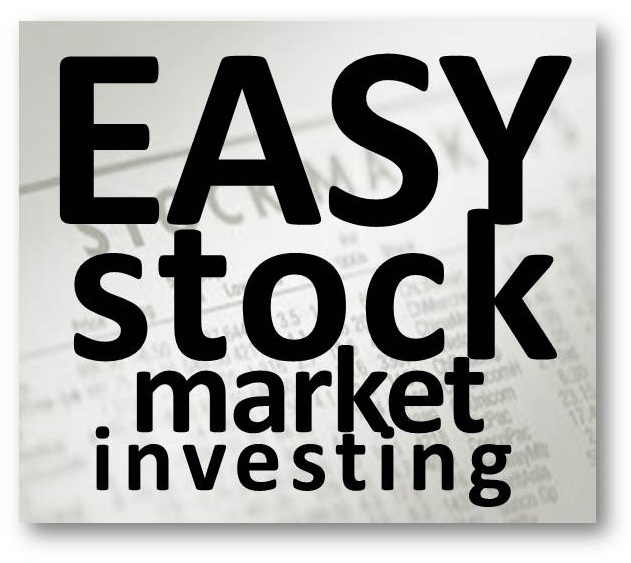 The upswing in the last three days allowed the main index to post a weekly gain of 65.67 points or 0.95 percent. Property stocks led the day’s rally as this counter surged by 2.21 percent. All other indices were likewise up. Value turnover amounted to P12.13 billion. There were 108 advancers that overwhelmed 44 decliners while 55 stocks were unchanged. SM Investments Corp. (+1.35 percent) and BDO (+3.61 percent) rose in heavy volume after BDO announced a record high P10 billion in net profit for the first quarter and a P20.4-billion profit guidance for the full year. Manny Cruz, chief strategist at Asiasec Equities, said investors were positioning for strong first-quarter results and that BDO’s strong first-quarter performance offered a good preview.At the same time, Cruz said there were speculations that the Philippines might soon get a second investment-grade rating, maybe even ahead of the mid-term elections in May.Before the Lenten break, Fitch Ratings gave the Philippine government its first investment-grade rating. Standard & Poor’s and Moody’s currently rate the country at a notch below investment grade but S&P has a positive outlook on its rating. Reuters.com also reported yesterday, "The Philippine main index hit an all-time closing high while Thai benchmark index rose for a second session on Friday after banks such as BDO Unibank Inc and Siam Commercial Bank Pcl reported strong quarterly earnings."